The likelihood of discovering dumpsites, labs and chemicals associated with the manufacturing of methamphetamine remains higher in more rural areas of the region, despite Wednesday evening’s explosion at a Sycamore Township home. The existence of the methamphetamine industry in the region is alarming, not only because of the dangers of its highly addictive use, but also because the manufacturing process is extremely volatile, officials said. “It’s very dangerous, especially if you don’t have it under control, which none of these are because they’re amateurs trying to be chemists, not in a laboratory but in their bedroom,” said Lt. Brad Winall, commander of the Regional Narcotics Unit (RENU) with the Hamilton County Sheriff’s Office. That’s exactly what happened Wednesday at about 9:50 p.m. in the 1900 block of Chaucer Drive, Winall said. Deputies found the windows blown out of the second floor of the condominium and siding blown off the exterior wall. Officials say the condo owner and her 58-year-old son were inside the residence at the time of the explosion. The owner remained at the scene but her son fled the area before first responders arrived. Winall said they have a suspect in custody, but he is receiving treatment for burns. One he’s released from the hospital, he’ll be taken to the Hamilton County Justice Center for booking, Winall said. “While our guys were in there, there was some acid that was spilled on the floor that started to catch the floor on fire,” Winall said. Neighbor Pat Jackson, who lives two doors down from where the explosion occurred, said she heard a loud boom and maybe a flash of light as she approached her window to see what was going on. Wednesday night’s explosion was the second methamphetamine-related incident RENU investigated this year at a Hamilton County home. The other incident torched a vehicle parked in the garage of home on Foxtrail Lane in Anderson Township in February. Throughout the county, there have been 11 methamphetamine-related incidents reported to the Attorney General’s Office, said spokesperson Jill Del Greco. Local law enforcement agencies report lab incidents to the state, although some do not, she said. 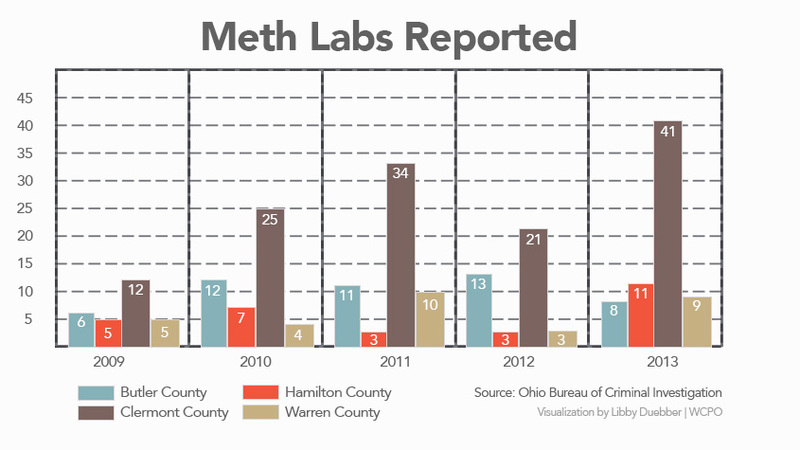 In Ohio, there were 348 methamphetamine-related incidents in 2009, 359 in 2010, 375 in 2011, 607 in 2012 and 881 in 2013, according to the Ohio Bureau of Criminal Investigation. Totals for each year are measured from October the previous year through September of the current year, following the federal fiscal year calendar. Ohio’s trend appears to be matching the national trend. Nationwide, the U.S. Drug Enforcement Agency seized 3,898 kilograms of methamphetamine last year, 2,481 in 2011 and 2,187 in 2010. DEA records date back to 1986. Winall said methamphetamine manufactures are turning to primitive processes to produce the stimulant. Methamphetamine is produced using an explosive cocktail of household goods and chemicals. Methamphetamine is mainly made with diverted products that contain pseudoephedrine, Winall said, and it’s commonly found in over-the-counter cough medicine and decongestants. Locally, one of the biggest challenges law enforcement agencies face is identifying small-time “cooks,” who may be just producing enough methamphetamine for a few days for use by a small number of people. Production of methamphetamine in soda bottles makes it easier to conceal, Winall said. Small-time cooks use ether, paint thinner, Freon, acetone, anhydrous ammonia, iodine crystals, red phosphorus, drain cleaner, battery acid and lithium taken from inside batteries in the production process, according to the U.S. Department of Justice. A majority of the methamphetamine RENU has seized this year is crystal methamphetamine that was brought in from Mexico and not made locally, Winall said. “It’s a higher purity of methamphetamine, probably not made out of someone’s bedroom,” Winall said.